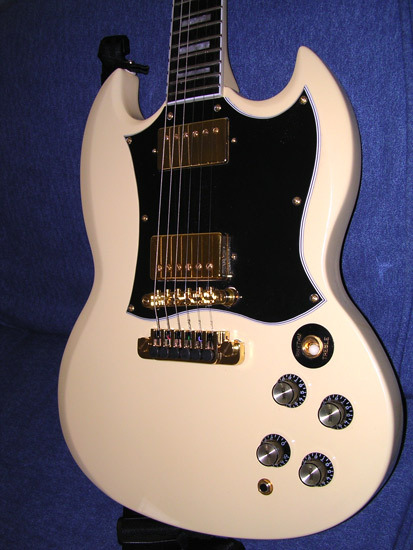 Discussion in 'Epiphone SG' started by abishai, May 31, 2005.
my other thread was moved so i remove the other question and just keep the Epi-related one. Does a Allparts SG STD pickguard fit a Epiphone G400 SG? Your thread was moved, because you double posted here and there. I just put em all in one spot for ya. It wont fit. The cuts are different for the horns, and the pickup spacing is not the same, ditto for the bridge. Ok, I know a guy who makes custom pickguards he can surely do one cheap for me.. but he can't mke 3ply as I want. Someone here has an Epiphone G400 '66 Reissue that has the full pickguard...I wonder if that guitar has the same hardware spacing as yours...cause if so, maybe he'd be kind enough to do a tracing for you. and have him make you one from that. I would think that a 12x20 sheet should be enough. No that's awright, to much work for it. I have a G400 Custom and I cut a full face pickguard for it as soon as I bought it. I liked the neck and the color but I wasn't crazy about the middle pickup. I bought the material from Stew Mac. I used a B/W/B/W/B 5 ply, made a template, and routed it out. It looks factory original. I'll post pics when I get home from work. I also made a W/B/W 3 ply that I may put on it if I get tired of the black one. I have the template and router and would be glad to cut one for anyone who wants one. All you'd have to do is send me the plastic sheet and return postage. If someone wants to make their own, I can email you a full size jpeg that you can use to make a routing template. I do like this guitar but I have changed a lot of it. 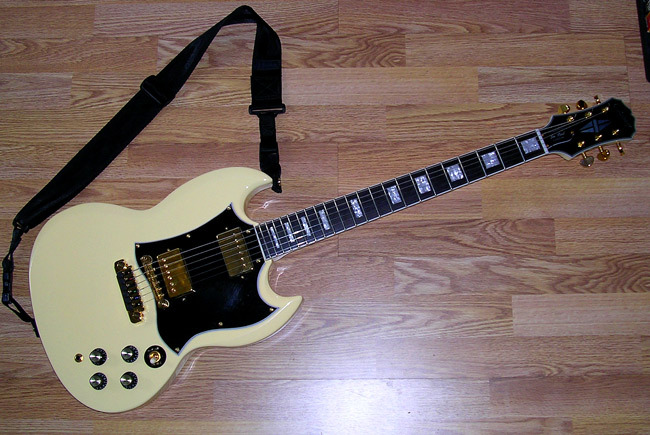 It has a Duncan Distortion bridge pickup with a gold cover and a Kent Armstrong vintage neck pickup with gold cover. Other mods are new pots (one is a push pull for coil split), new switch (no more orange! ), and a Gibson gold TP-6 tailpiece. Oh yeah, nice forum here. I've been lurking awhile and finally got around to posting. I usually hang out on the HC electric guitar forum. It's definitely the most beautiful Epi SG I've ever seen. Thanks! I'm real happy with this one. I had all the mods figured out before I bought it and it came together perfectly. I have to highly recommend the TP-6 tailpiece. The tone and sustain greatly improved when I put that on. Thanks for the advice Pete! If I'll have a possibility and the time to buy, I'll try. But who knows the future: in theory I've bought this little axe as a practice tool. But now I don't know, maybe I won't buy the Gibbo std 'cos I'm satisfied. The only thing I got to do is to polish the unvarnished lacquer. I use it without cover. Wow, that IS the nicest Epi I've ever seen! Looks like one of those Limitied Edition Gibson Specials that came with gold hardware and white paint. Man, I don't know what is happening I becoming an Epiphone fan. And your axe is just helping the reasoning that some of these Epiphones are right side by side with Gibsons. 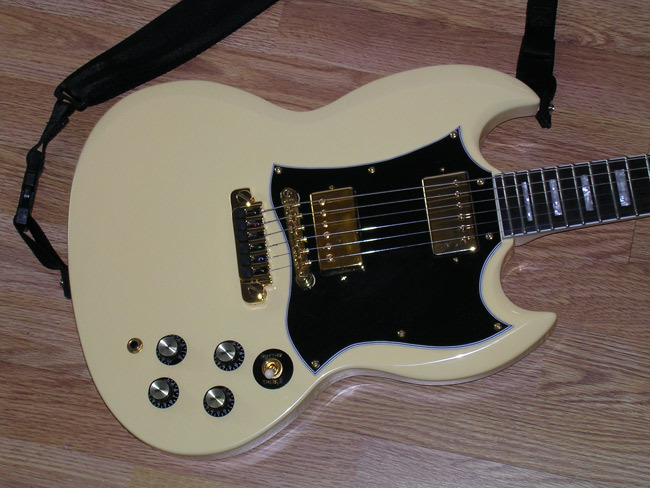 I'd love to get full face guard for my new main AXE Epiphone Vintage SG. Think it has same dems as your Custom G400? Not sure if it will fit but I can scan my pickguard and email you the scan. Just print it out full size, cut it out, and see if it fits. Send me your email addy if you want to try it out. You can buy custom pieces or make your own, making your own is cheap, fun and easy! Hi Pete, I just saw your old post, I'm only new on here. I'm moding my G-400 Custom to a '66 SH Custom like Hendrix's, & I need to get the fullface batwing pickguard!!! Is it possible for you to do one for me if I send you a blank??? I was going to get the luthier doing the work on mine, but he's pretty flat out with extra work, & if I can save him some time!!! Mucho thanks. Gbux.